Brittian first mentioned this book to me. Mind you, he mentions an awful lot of books to me. Second, I believe I heard the author (Mary Doria Russell) on Speaking of Faith on NPR. After borrowing the book and thumbing through the first first 3o pages or so over the course of a few weeks, I finally was hooked. I don't know when it happened, but I dropped all other readings and was suddenly and totally engulfed in this story of a Jesuit priest on a mission to make first contact with aliens. Weird, right? But knowing that my own journey in and out of faith and doubt was at least somewhat similar, I felt deeply connected to several characters in the book. I'm not going to tell you the plot or describe the characters. If you wanna read the book, pick it up. You won't regret it. But there is a passage toward the end of the book that really resonated with me and I thought that I would share that. It's something the main character (Emilio) of the book is saying, considering his trip to this new planet and all his experiences, both beautiful and horrific (to say the least). "You see, [this] is my dilemma: ...if I was led by God to love God, step by step, as it seemed, if I accept that the beauty and the rapture were real and true, then the rest of it was God's will too... But if I am simply a deluded ape who took a lot of old folktales far too seriously, then I brought all this on myself... The problem with atheism, I find, under these circumstances...is that I have no one to despise but myself. If, however, I choose to believe that God is vicious, then at least I have the solace of hating God." Powerful. The issue of God's agency in the world, especially in terms of dealing with pain/evil, is not a light topic. And I feel that Russell dealt with theodicy in a fairly thoughtful way. One that, at least to me, met me where I'm at. What good is God for? is the question that persists. Personally, I wouldn't label myself athiest, but I really don't know that the existence of God matters much to me anymore. What difference would it make? Keep in mind, I'm not saying that I have not been deeply formed by a tradition that holds God's very existence at it's center. I am stating where I'm at now. I can hear the barrage of potential questions and flaming exhortations that could come in response to this post, and I'm fine with that. But I really wonder why this is such a delicate subject to approach. Would it really change your life drastically? Are you certain? And what does that say about you? About us? ML -The Barrel is Bleeding! The wine is really coming along. 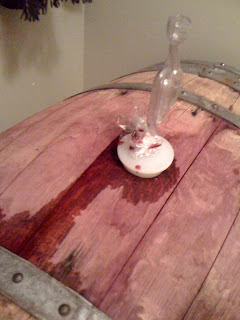 We blended about 2 1/2 gallons of our Petit Sirah into the barrel. We had tried a test blend and loved it, so we took the next step. We wanted the PS to have some time in the barrel to get some breathe-time. Even at this point the flavor profile is quite complex. We are hoping the oak and fruit flavors will come more into balance. The mouthfeel is viscous and has velvety tannis already. We aimed not to press too hard on those seeds. I am trying to keep the temp of the room around 70-75' as to promote healthy secondary fermentation. But it's difficult being that it's in the 30s at night here! The plan is still to bottle in Fall or Winter 2010. Still not sure if we will fine or filter the wine. We want to make sure it's of highest quality, so we'll figure that in the months to come.